There are claims lives could be lost if one or more of Wales' three main coastguard stations close. Reports suggest the Department for Transport (DfT) is looking at shutting up to half the UK's 19 stations as part of spending cuts. 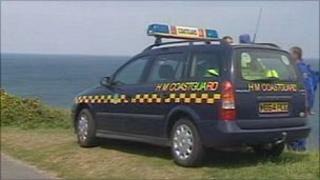 Coastguards are co-ordinated from Holyhead, Milford Haven and Mumbles, Swansea. The DfT would not comment ahead of a decision but ministers said there was a principle of using "resources wisely". The DfT, which needs to cut its spending by 15% over the next four years, is also expected to press ahead with plans for a private company to take over the UK's search and rescue helicopter fleet. South Wales West Liberal Democrat AM Peter Black said he had concerns about what the changes would mean for the Bristol Channel and Irish Sea. "My concern is that Mumbles coastguard station, which is a major station for the Bristol Channel and the whole of south Wales could be lost," he said. "There would be impact in terms of employment and an impact in terms of safety for people in the south Wales area. "It could lead to lives being lost. This is an emergency service and we need to continue investment in that service." Neither the Maritime and Coastguard Agency (MCA) or the Public and Commercial Services Union, which represents coastguard employees, would comment ahead of the announcement. But some lifeboat volunteers said they feared cuts could hit services. Nathan James from the Loughor inshore lifeboat based near Swansea said each station already covered large areas of sea and land. "I think cuts in the coastguard may cause issues during busy periods in the summer time," he added. "If there was a couple of large incidents they may not be able to cope." Chief Secretary to the Treasury, Danny Alexander, told BBC One's Andrew Marr Show on Sunday that Transport Secretary Philip Hammond would set out details about the service over the next few days. He said the government's key principle on this and other expected announcements was to "use our resources wisely so we reduce waste". The DfT said they could not comment until an announcement was made - which a spokesperson said would be "soon".